The original Churchyard, the area immediately surrounding the church, 0.35 acres in extent, was probably in use as the Parish Burial Ground by 1000 A.D. It served the needs of the parish until 1854 when the first extension of the churchyard took place round the North and West sides of the original ground. The churchyard was further extended in a number of phases once St. Giles Parish became established in 1885, see 'New Graveyard, below.. This map is undated. It includes features added in 1909, but does not show the war memorial, which was constructed in 1922. 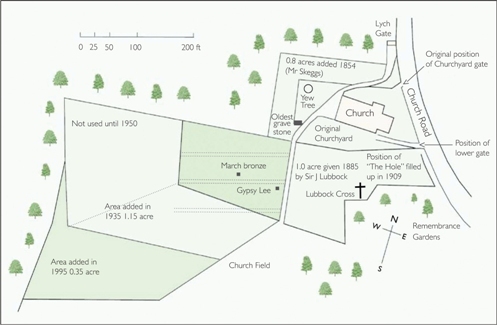 It clearly shows the layout of graves in the churchyard as it was before the 1935 extension. Note the intricate interweaving of adult and child graves, showing that child mortality at the beginning of the last century was far higher than now. Many child graves never had memorial headstones erected, so these areas today mainly form small clearings between the many surviving memorial headstones in adult graves. However it would also seem that some at least of these areas reserved for child graves never in fact got used. The pressure for space before the 1935 extension led to most of the north-south oriented pathways being abandoned and the space used for further burials. This explains the somewhat disjointed grave numbering pattern in that part of the graveyard. 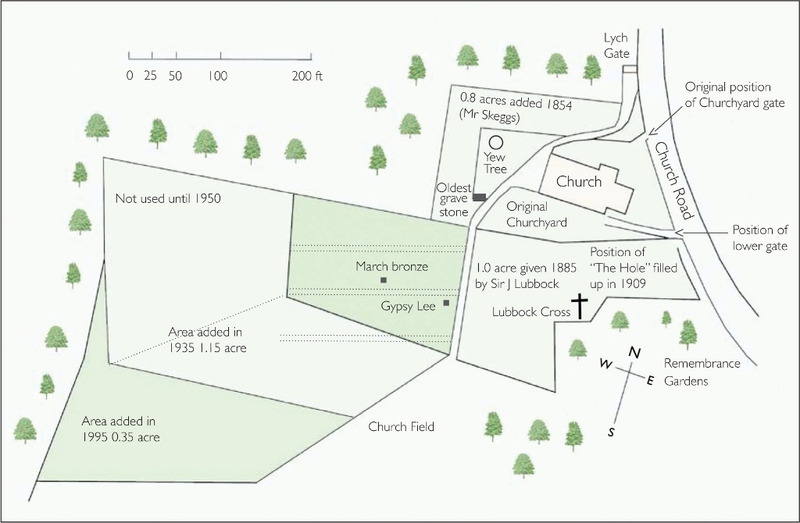 The further areas added to the churchyard in 1935 and 1995 are shown in this modern map. From 1538 the names of people buried in the Churchyard, have been recorded in a Burial Register, but it is only since 1885 that a Grave Register has been kept, which records where a person is buried. Burial registers prior to 1990 are now archived in Bromley Local Studies Library. Grave Registers are still active documents so are located in the Church. The original area plus its 1854 extension are known today as the 'Old Graveyard'. It is thought that it ceased to be used for new graves from 1885, but further burials in existing graves continued until the Second World War and, very occasionally, even today. 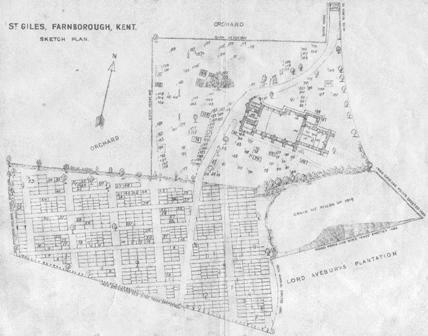 Kent Archaeology Society publish a map of the Old Graveyard, together with a list of graves and burials dated 1919. These were integrated into the St. Giles records during 2012. In 1885, a further area of land was acquired to the south of the existing, to be known as the 'New Graveyard'. This was used for new burials, in parallel with the original graveyard adjacent to the Church..
Extensions to the New Graveyard took place in 1935, and again in 1995, into land from the adjacent Common. Burials in the New Graveyard are documented in three volumes of 'Grave Registers', which can be inspected by appointment with the Parish Office.